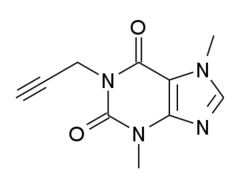 DMPX (3,7-Dimethyl-1-propargylxanthine) is a caffeine analog which displays affinity to A2-adenosine receptors, in contrast to the A1 subtype receptors. DMPX had 28× & 15× higher potency than caffeine in blocking peripheral and central NECA-responses. The locomotor stimulation caused by DMPX (ED50 10 μmol/kg) was similarly higher than caffeine.